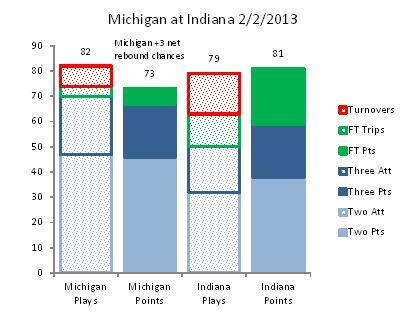 Michigan looks good on turnovers, but that comes at a cost — they get crushed on free throws and two point percentage. Having watched the games, I can connect the dots for you: the Wolverines don’t drive to the hoop much against good teams. They have some great shooters who can get reasonably open (Trey Burke, Tim Hardaway, Jr.) who are happy to “settle” for jumpers. 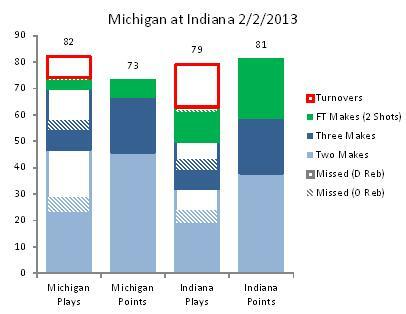 This keeps the ball out of danger in the lane (low turnovers), but it means that Michigan never gets to the line and shoots a lower percentage on twos as well. Michigan also rebounds a lower percentage of their own misses than the opponent, which could be related — a lot of “second chances” are just put-backs after a shot close to the hoop. So, is Michigan sunk? We’ll see. I have some faith that Mitch McGary can improve and find some high percentage twos down low, but right now, Michigan is probably not efficient enough offensively and not good enough on the boards to compete with the best teams in the country. I would worry less about four games if the problem was just poor shooting in a small sample, but the problem seems to be about playing style against good defenses. I don’t think that’s going to change. Yesterday, I posted a new idea for visualizing box scores: Game Stacks. While the first version did a good job of showing shooting percentages and turnover rates, it didn’t do a good job on rebounds. 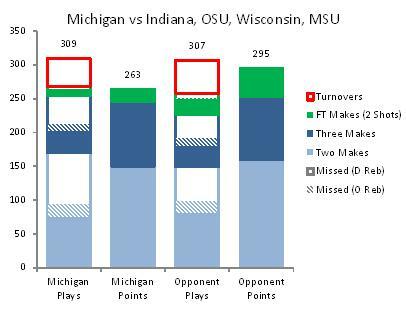 As my pops pointed out, Indiana had a big rebounding advantage over Michigan by the basic numbers (36-22), so it seemed wrong to rely only on the height of the stacks to determine who rebounded better. 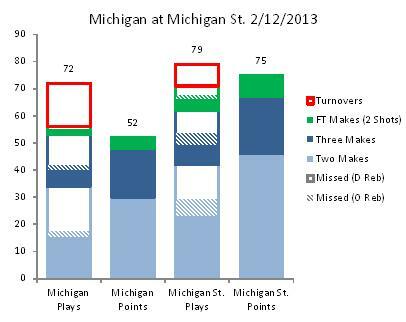 The reality: Michigan got more chances not because they rebounded better, but because they had more misses — and you have to miss to get a second chance. 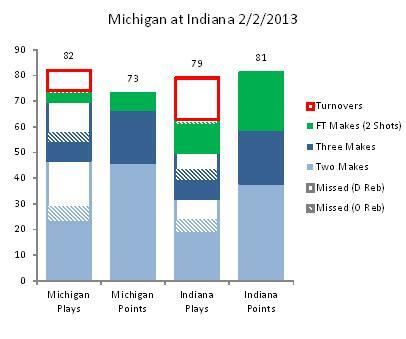 The height of the stacks just showed that Michigan got more offensive rebounds, even though their rebounding rate was terrible. Off reb rate = your off rebs/(their def rebs + your off rebs). Then, I multiplied this rate by the relevant number of shots to generate the “Missed (O Reb)” category for each type of shot (the dashed regions). 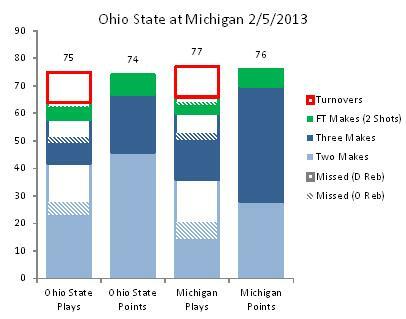 Each dashed/empty combo now visualizes the offensive rebound rate for the relevant team. Note: On my dad’s advice, I posted another version of the Game Stacks that depicts rebounding rates, rather than just total offensive rebounds. The discussion in this post is a little naive on that point — the new version yields a better analysis of rebounding. I have a general hang up when looking at the box score for basketball (or listening to announcers list off statistics). I see some rebounding numbers, but I can’t tell who rebounded better without offensive and defensive breakdowns, plus the number of shots missed by each team. 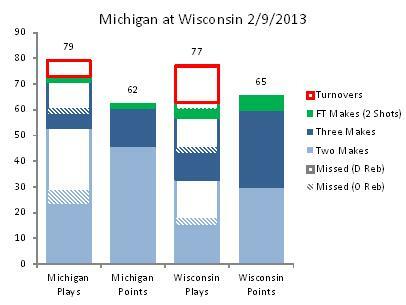 And I see shooting percentages and shot attempts, but it’s hard to put it all together into how a team got its points. During the NBA season this year, I wrote up some parameters for an alternative way to build an NBA winner: The Seattle Scientists. The idea behind the Scientists is the same old Moneyball methodology for small market teams — find the undervalued assets and spend your money there. In the NBA, my buddy Tony and I think effort, defense, and intelligence are the assets to focus on. In the the MLB, there are some related options: bunting, speed, and defense again. We settled on the Portland Peskies for this thought experiment (an over-educated city that would appreciate a non-traditional team), though the Indianapolis Institute and the Las Vegas Vig (“You can never beat the house!”) were also in the running. Why do you have to hand the ball to the ref before you throw it in? Wouldn’t it be much more exciting to let players throw it in as soon as they can get a ball, like a soccer throw in? Teams are allowed to do this after a made basket already. Add another commercial break to balance out the faster pace if that’s what it takes. Why can you only draw a charge if you stay on the ground and fall over? The offensive player can draw a foul while jumping and keeping his feet, why not the defense? If the defender jumps, the best case is a no call. Referees have a big say at the end of basketball games, but it’s not a bigger say than baseball umpires, for example, who must make every ball and strike call. I think one of the reasons people persecute basketball refs (besides the Tim Donaghy scandal) is that the foul rules aren’t especially consistent. Why do teams get so many timeouts, especially in the first half? They have lots of practiced plays that they can signal in from the sideline. I suppose that the endgame timeout flurries increase the tension on those individual plays, but the downtime in between is no fun, and I bet the rest of the game seems less important by comparison. Again, if we need a couple more evenly spaced TV timeouts or sponsors on the jerseys to compensate, I’m fine with that. These are my questions. Do you have any answers?